Spray paint allows you to quickly paint items without the labor-intensive task of using paint from a can and a brush. If you don't use the entire can of spray paint at one time, you don't have to throw it out in the trash. Spray paint will keep just fine in your garage — provided you store it properly. Improper storage may result in the spray can not working the next time you want to use it, or possibly harming people or your property. Store spray paint properly to avoid injury or damage to the paint. Put the lid on the can prior to storage. This helps keep the paint fresh and prevents the can from inadvertently triggering. 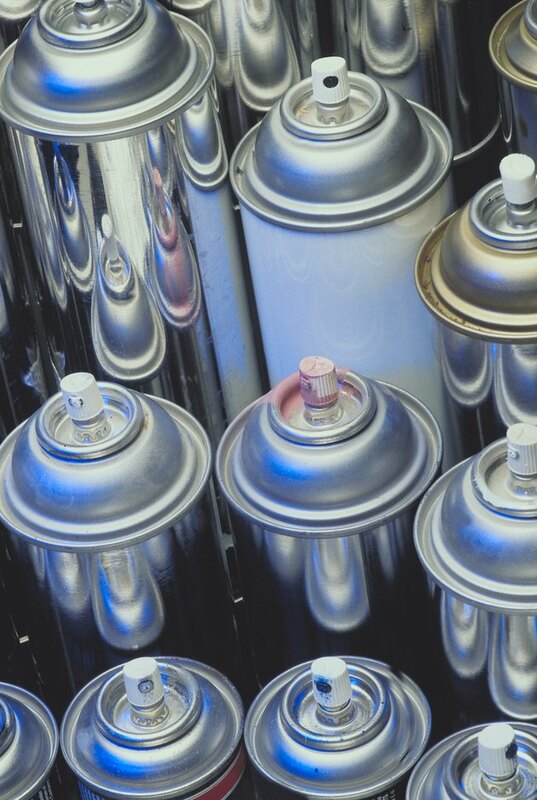 Store spray paint cans in the garage only when the temperature is between 55 and 80 degrees Fahrenheit. Higher or lower temperatures may degrade the paint and make it unusable. Never store spray paint cans in spots that are above 120 degrees Fahrenheit. Such extreme heat can cause the cans to burst. Keep spray paint on a shelf in a dry spot and away from flames, sparks or direct sunlight, which can also cause the cans to burst. How Can I Remove Paint From a Kitchen Appliance?